re: Happy 4th Birthday Alone! Happy 4th Birthday <Alone>! A big shout out to the people that have made this possible, the people who've stuck through the good and tough times, and the companion pets who have died endlessly on all the boss encounters. Technically, the birthday was yesterday (11/05), but I forgot... whoops. I loved my time raiding with you guys, and am loving my time being a casual baddie. Thanks to all the people that have sacrificed their time and sanity to make that happen, and congratulations to the raid team on their continued success. Yes, congrats to everyone who has been here for a very long time. I'm sad that I wasn't able to continue and I miss raiding with you all dearly. I hope this guild has many more birthday's to come! Awww, I totally forgot about it as well! Third expansion in a row of successful continuous 25man raiding, not missing out on a single raid week! Impressive indeed. Thank you Dabo for the nice gesture, especially during times of new raiding tiers and hard progression we tend to forget about the important happy milestones that we all should be proud of! It's great to see you back in Azeroth, even if it's just the few hours you get off work and school during the weekends. The shout out flatters me, but one person doesn't make the guild. Each single player contributes to the unity, and all of us officers just have to make sure that the engine keeps running smoothly. It is kinda an irony with our guild name though. Through the years, we developed so many close bonds and friendships that I sincerely believe that nobody actually feels alone in the guild. I joined Alone early in March of this year a few weeks after they killed Heroic Deathwing. I was keeping a good eye before they vanquished him. I noticed this 6/8 guild looking for a retribution paladin. I was already interested but I did not think I could make the raid times since I live on the west coast. 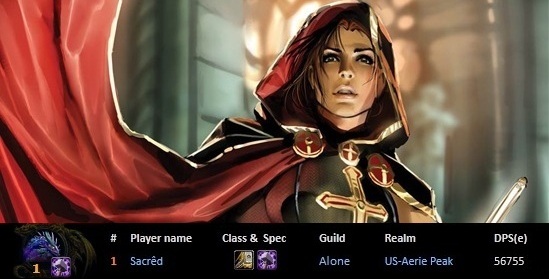 However, after I saw Alone go 8/8 very soon after they were still looking for a retribution paladin. I had to take the opportunity no matter what. When I got to Alone I was pretty mediocre but there were so many spectacular players (top players of their class and spec imo) I became a better player as a result. This isn't just the best guild I've been in terms of progression. It's the best community I have ever been apart of in a guild. I like everyone in this guild and I consider many of the people in Alone as friends. I told Eneia this when I joined, "I see so much potential in this guild to do something special, and that's why I wanted to join." We've achieved more than I even expected. Even though we have a long way to go, I have never been so excited and happy to play this game and I would never ever want to do it with anyone else besides ALONE! Pfff! We wouldn't know what to do without our bear ='(! You certainly put the most effort in here <3 Ya know not sleeping much at all and that stuff. Oh those FL 10 alt runs were fun when you were 80% asleep.